The 48th ASEAN Foreign Ministers’ Meeting (AMM 48) and related meetings concluded in Kuala Lumpur, Malaysia, on August 6 with the issuance of the Joint Communiqué affirming the bloc’s solidarity in establishing the ASEAN Community later this year. The Joint Communiqué entails policies and future orientations for ASEAN based on the three key pillars of political security, economics, and socio-culture. The Post-2015 ASEAN vision in particular sets out the community’s orientation for the next decade, such as accelerating international integration and cooperation; creating a people-oriented, people-centred and rules-based group; promoting the central role of ASEAN; and enhancing relations with foreign partners to obtain their support for the establishment of the ASEAN Community. The FMs highlighted the role of ASEAN partners and suggested increasing cooperation mechanisms, including ASEAN+1, ASEAN+3, the East Asia Summit (EAS), and the ASEAN Regional Forum (ARF). They also expressed concern over the recent developments in the East Sea, in particular action that could escalate tensions and threaten peace, security and stability in the East Sea. 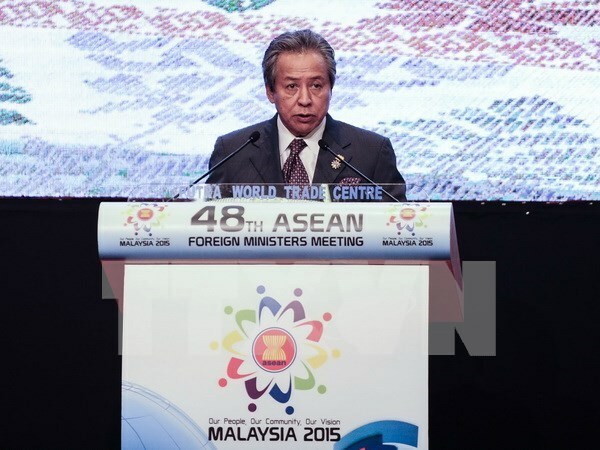 The Malaysian Foreign Minister Anifah Aman told the press that ASEAN reached a consensus on a number of issues, including the implementation of the 2009-2015 Roadmap for an ASEAN Community.